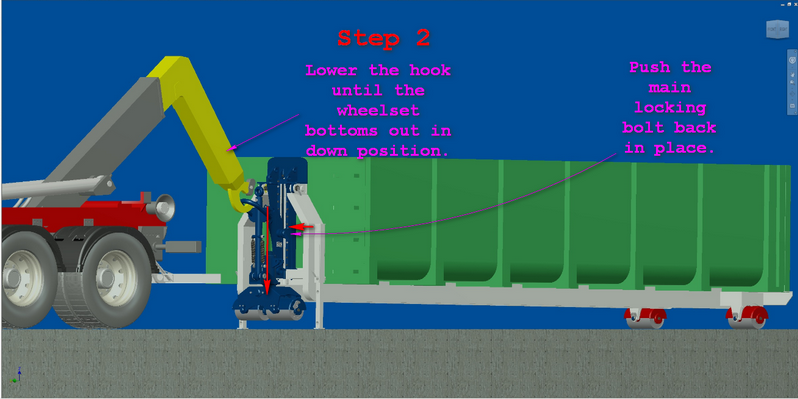 Here is a video of the operating procedure for the Jack-Pack hook lift container caster as well as a step by step guide on how it works. The animation above shows the procedure with a newer version of the manual operated Jack-Pack, it's basically the same as it was on the old one described below. How to operate the Jack-Pack without the optional hydraulic kit. The container has to be adapted to Jack-Pack standard in the front end for this to work. Leg stands is required to operate the Jack-Pack Basic version, but they are not needed for the hydraulic version. The loading and unloading of the container requires 3 additional steps compared to a standard container, all 3 are done by the hook loader itself. Step 4 in this guide is mandatory to all containers whether it’s equipped with Jack-Pack or not and it is therefore not counted as an extra Jack-Pack step. When the truck leaves the site after unloading the container then it sits on all 4 wheels and ready to roll. You can see a video of the procedure here. The hook lift operator unloads the container half way to the ground, that means bringing the rear end of the container to rest on its wheels and the front end hanging in the hook of the truck about 1 meter above the surface. While it hangs in the hook of the truck, the operator lower the leg stands to its down position AND in the same step he is pulling the locking pin bolt in the device that's unlocking the wheel set from the main slider. 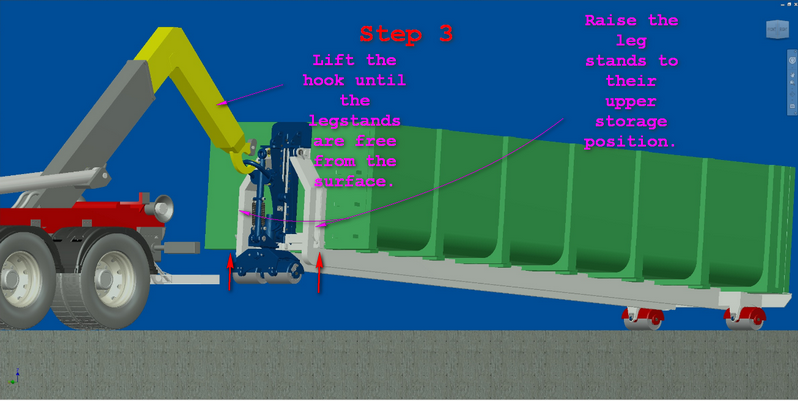 This makes it possible to move the wheel set down by gravity when the truck lowers the hook in step 2. In step 1 also make sure that the wheel locks are engaged. The hook lift operator lowers the container until the leg stands rests on the surface. When the leg stands rests on the surface the operator will continue to lower the hook and the wheel set will slide down by gravity until it bottoms out in the lower position. When the wheel set has reached its bottom stopper the operator put the locking pin bolt back in place so the wheel set is locked in down position. The hook lift operator lifts the container back up so the leg stands are free from the surface and then raise the leg stands to its upper position. The hook lift operator lowers the container to the surface and drives off. The container is now on 4 wheels and ready to roll. This guide shows that the Jack-Pack Basic version require 3 additional steps from the hook lift operators side when unloading and loading the container. Step 4 is mandatory to all containers whether it's with or without Jack-Pack and it will therefore not count as an extra Jack-Pack step. The only thing left to do by the user of the container is to release and lower the drawbar that is locked in its upraised position by one pin bolt and after it’s hooked on to the towing vehicle, unlock the wheel locks. When the truck is back to pick up the container then these 4 steps are reversed. Operating Jack-Pack with the optional hydraulic kit require a hydraulic power source like the auxiliary out that is to be found on most hook loaders, machines and tractors these days. You simply connect it using hydraulic quick couplers and then you can move the wheel set up and down as you wish. See it on video here (old version of Jack-Pack). The leg stands shown in the step by step guide above is not needed to operate the hydraulic version. Above you can see it on the truck with and without the Jack-Pack device. The unit can remain on the container permanent or just attach it for some special jobs.